Sign up for our internationally accredited 200 hour Vinyasa Yoga Teacher Training. We offer you a course that allows you to deepen your practice and make yoga a bigger part of your life. Stay light, flexible and strong in your body and mind, on and off the mat. • Dive deep into the study of yoga postures, anatomy and philosophy. • Learn how to sequence energetic yoga flows and design inspiring yoga classes. • Practice how to stay more present, grounded and loving with yourself and others. Joining our Yoga Teacher Training will provide you with a great framework to enjoy all of this. This course is a great foundation to deepen your own practice or to start/further your yoga education. 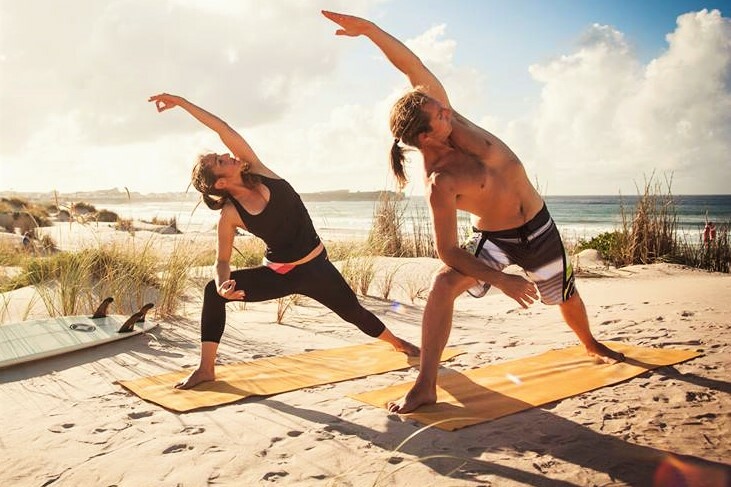 Have you ever dreamed of traveling to a place by the ocean and sharing the gift of yoga with others? Well, that is just where you might end up. This course is accredited with the International Yoga Alliance. Once you have completed our 200hr course you will be eligible to register as a certified yoga instructor with the Yoga Alliance. This will allow you to be able to teach in yoga studios, gyms and ashrams throughout the world. This course will also be accepted in any training where you would like to further your studies toward becoming a 500 hour certified yoga teacher. All of the classes will be taught in English and we can offer German translation in some cases for clarification. Techniques/ Training/ Practice Learn how to do asana with proper alignment. Practice and explore pranayama techniques. Dive into mindfulness and mediation. Yoga Anatomy/ Physiology Learn about all aspects of yoga anatomy so you can safely guide students. Explore the energetic and subtle body. Teaching Methodology Learn how to create inspiring yoga classes, sequence yoga ananas, adjust students, and to speak with confidence. Integrative practice and teaching Philosophy, Ethics and Lifestyle Learn about the history of yoga and yoga philosophy. Understand how to integrate this wisdom to live a happier healthier life with clarity and purpose. Practicum We work with each other in small groups to practice teaching so that you learn in a comfortable setting. Our 200 hour vinyasa yoga teacher training will begin in September 2019 and run on one weekend each month on the following dates. Upon registration a 500,- € non-refundable deposit is required to hold your space. Four weeks before the start of the course the balance is due. Bring a friend discount: Bring a friend and save 250 Euros in your own tuition. Apura Yoga has been offering yoga retreats worldwide since 2012. We have taught over 100 retreats and thousands of people over the years on the benefits of yoga. With over 3 decades of combined experience in yoga practice. Dr. Yvonne Stolz-Longaker (E-YRT) and Donovan Longaker (EYRT) have an extensive background in yoga practices and philosophy. We pay close attention to detail when it comes to how to teach others and what specific adjustments people may need in different circumstances. We also teach about proper alignment of the body in detail, so that students can safely practice asanas without injuries. Yoga is a practice of self exploration. If you would like to increase your understanding of yoga and follow a path towards a better understanding of yourself and others, then this course is for you. We encourage you to join and experience the benefits of yoga and sharing this with others. Yvonne has been practicing yoga for almost 20 years. She is a yoga teacher, a surf teacher, systemic coach and consultant. Her spiritual practice is Tibetan Buddhism. Yvonne's yoga classes are creative and full of love. The way she teaches incorporates many different yoga styles into the practice. She finds it important that the practice of yoga is accessible to everyone, regardless of the age or the requirements of each body. Yvonne's classes provide a safe framework for yoga students of different levels, to come back into contact with their bodies and to feel comfortable in them. Donovan is a Californian native. He has been practicing yoga for over 2 decades and has been teaching Vinyasa Flow since 2007. He grew up around Tibetan Buddhism and took part in retreats of many great Tibetan masters of the last century. He has completed a traditional 3 year meditation retreat. Among Donovan's Yoga teachers are Marc Stephens, David Swenson, Victor Dubin and many others. His classes are powerful and dynamic. He works through the whole body, creating an atmosphere that allows the yoga practitioner to stay with the breath so that later they can rest in a state of meditation.